Price: £6.95 (incl VAT) Sorry, this product is no longer available. 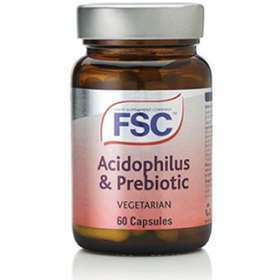 Lactobacillus acidophilus is a very good bacterium and along with Fructooligosaccharides provides balance for the digestive tracts function for healthy processing and absorption of nutrients. This important role of maintaining good digestion helps offset ailments like diarrhoea, irritable bowel syndrome, and intolerance to lactose and promotes an overall healthy immune system. It also assists to treat conditions of eczema, asthma, and vaginal infections. Acidophilus can be most of benefit whilst travelling when the gastrointestinal system is introduced to new foods and water sources when in different environments. It is essential to maintain your body with adequate quantities of Acidophilus to achieve the required healthy balance of the gut flora and a prebiotic for a healthy digestive system. Lactobacillus Acidophilus 1 billion viable cells. Ensures Latase which assists Lactose breakdown. Gives good body absorption of nutrients. Fructo Olligo Saccharides, Bulking Agent (Microcrystalline Cellulose), Vegetable Capsule Shell (HydroxyPropylMethylCellulose), Lactobacillus Acidophilus, (Freeze Dried Lactobacillus Acidophilus, Maltodextrin, Proprietry Stabilizer, Ascoribc Acid, Lemongrass, Glutamines), Anti-Caking Agents (Magnesium Stearate, Silicon Dioxide). Vegetable Source. Product code: FSC-4100 Price: £6.95 (incl VAT) Sorry, this product is no longer available.